It was just two years ago that Mark Carney was writing his fourth letter to the British Chancellor, explaining why the country was in a deflationary slump. Even then households were feeling the pinch, despite what officials reported. 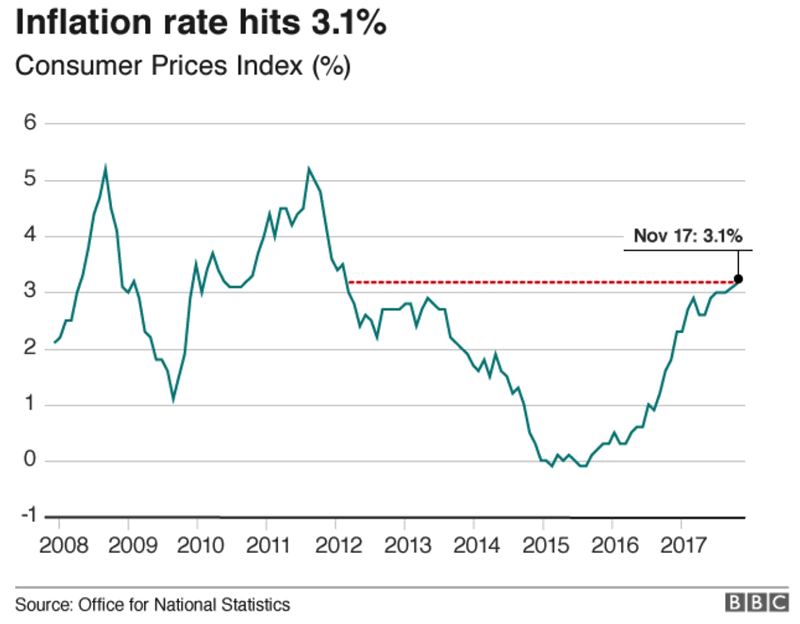 Since then Brits have become increasingly vindicated as inflation figures have begun to show what they have all known for some time – prices and the cost of living is on the rise. Now Mark Carney is forced to write a different type of letter to the Chancellor, one where he will have to explain why inflation is above target at 3.1%. The jump to over 3% in the year to November is the fastest paced increase seen in nearly six years. The Governor of the Bank of England now finds himself in a bit of a quandary. Usually a central bank would increase interest rates in order to combat inflation. Currently the UK’s stands at the punishingly low 0.5% so one would think that there is plenty of room for manoeuvre. However, debt levels in the UK are massive – at every strata of society – and increase rate rises will lead to a recession or indeed a depression. There is also the not inconsequential matter of Brexit. 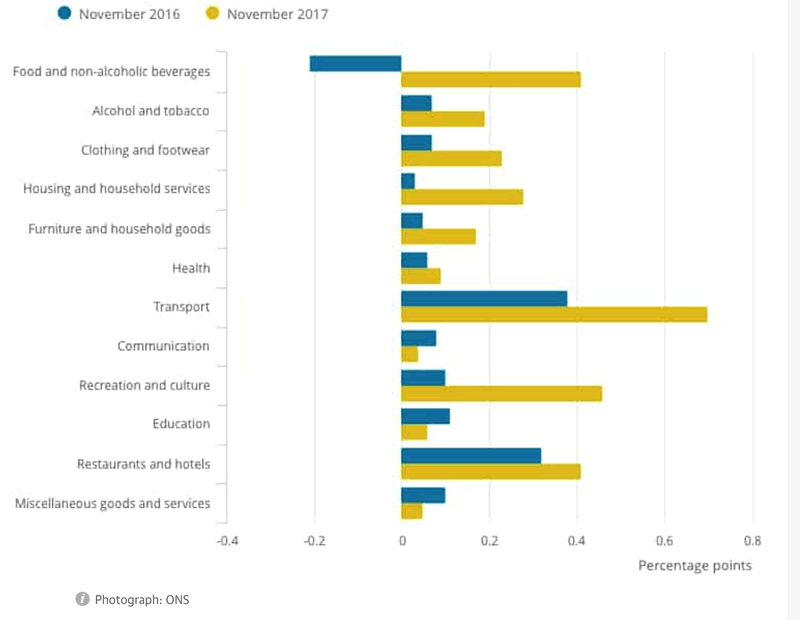 Brexit is now seemingly more important than the spending and saving power of Britain’s households and must be considered when looking at a rate hike. When rates were raised last month (the first time in a decade) it was done with the Bank of England’s acknowledgement that Brexit was likely to hurt the country’s growth prospects. So the MPC erred on the side of caution. With the Brexit cloud growing ever darker and uncertain, the Committee are aware of the need to keep consumer spending, the engine of the UK economy, pumping along. However, if inflation is not ‘handled’ then too much inflation could threaten the central bank’s grip on the economy. Too much inflation could result in total engine failure. For savers, pensioners, businesses and households the situation should really be a no brainer. Household bills for food and non-alcoholic drinks are now up by a punishing 4.1% in the last year. And that discounts the stealth inflation that is taking place in the UK and internationally in the form of shrinkflation. Shrinkflation in the UK is very real with real inflation much higher than reported and realised as consumer items, especially food, shrink in size while prices remain the same or go higher. Savers, pensioners and households are likely tearing their hair out as economists rush to point to airfares and computer games as the main causes of increasing inflation figures. This is of little consequence to a household pushed to its limits when it comes to feeding and clothing a family. A flight to Malaga or the next Grand Theft auto is likely the last things on parents’ minds. The squeeze is so tight that many households have been forced into credit card spending and other forms of borrowing. This has been ‘manageable’ so far as deals offered by credit companies often mean no payments for a set period, free transfers and interest rates make little difference to borrowing costs. The primary way to combat inflation is to hike interest rates. This will be good if it brings down household debt in the long term but painful as it will push up the cost of debt in the short and likely medium term. Currently UK household debt stands at £1,630.1 billion, an increase of 19% in the last five years. Sadly the latest measure does not include the rise in fuel prices. This is something else households and businesses are feeling the pinch in and must feel frustrated that it is so rarely acknowledged by those deciding the fate of finances. The RAC have today warned that thanks to the shutdown of a major North Sea pipeline could push fuel prices up by a further 3p. This will be felt acutely in an economy that saw fuel and raw material bills for manufacturers up 7.3% in November, up from 4.8% in October, while factory gate prices rose by 3%, up from 2.8% in October. Those who actually live, spend and want to live in the black have a terrible dilemma on their hands. Inflation is killing them, debt is helping them to get by but the solution to both is going to be crippling. Sadly there is currently little incentive to save. Wages are not keeping pace with inflation and the latter just eats away at cash in the bank. UK savings are at their lowest in fifty years. Latest readings show weekly wage inflation is just at 2.2%. 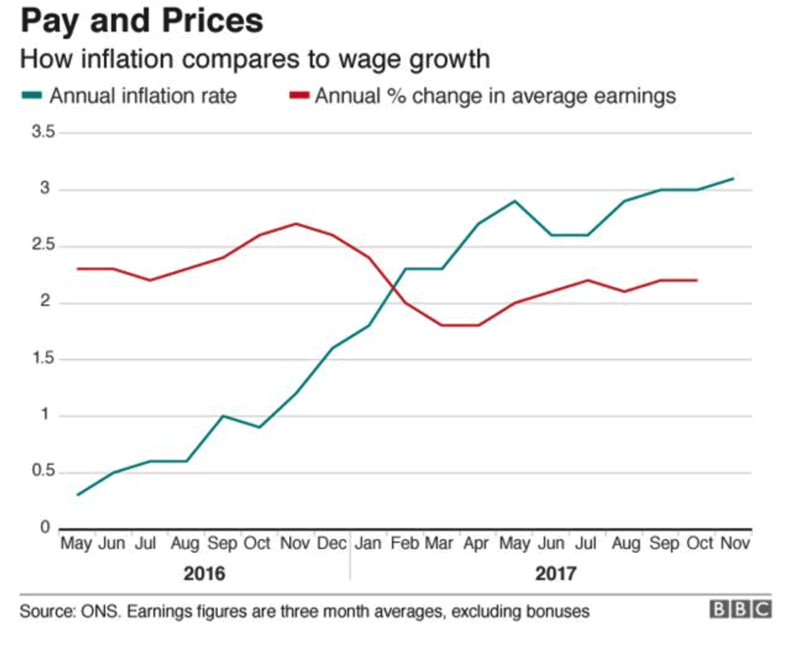 For those recalling inflation levels of the 70s and 80s and are currently scoffing at an inflation reading of 3.1% it would be worth reminding you that back then wage inflation was actually outpacing the CPI. 30-40 years ago the logic that wages would respond to higher prices and outpace them was really happening. Today, this is a fallacy. The situation is made worse by what is in store for the UK economy. Following the release of the inflation figures many economists were quick to reassure that we were now seeing the peak of inflation. This is highly doubtful. The Bank of England and ONS are pointing towards the weak post-Brexit pound as argument for inflation levels. In truth, the fall in sterling was just the much needed catalyst inflation needed in order to appear in official readings. Households, businesses and savers and been feeling inflation long before Brexit was even in our common lexicon. We have inflation today, as we have for at least the past five years. But along with it we also have shrinkflation and now what appears to be signs of stagflation. Stagflation occurs when there is persistently high inflation combined with stagnant demand and low employment levels. 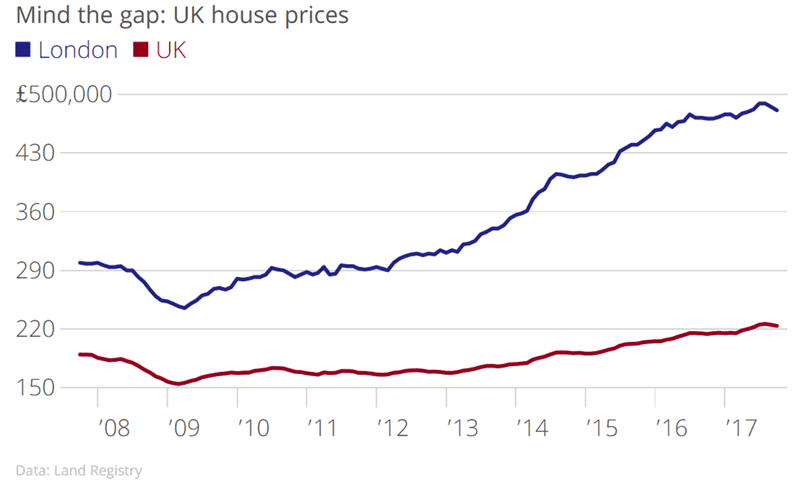 This is appearing in the UK housing market where prices are down for the second-month in a row and the volume of transactions is falling. Unemployment remains low in the UK but this looks set to change. From Brexit to stagflation to debt levels it is tricky to see how Governor Mark Carney can turn this situation around. Whilst he might, just might, be able to pull it out the bag for the sake of appearances the ‘solution’ is unlikely to be one which is beneficial to savers. The monetary policy we have fallen victim to is wealth ignorant. It does not create or protect wealth. It eats away at it month by month. It shows little regard to how you spend your money and where you hold your cash. This why investors and savers must diversify their portfolios and own real assets which cannot be devalued by monetary and government policies. Investments such as gold and silver by their very nature are immune to the effects of inflation, stagflation and the dangerous ideas and experiments of central banks. This year gold is up by nearly 8% and acting as . Wouldn’t it be nice next time the UK inflation figures are released to consider how your portfolio has done in real terms thanks to precious metals?